What kind of Alaska salmon fishing lodge are you looking for? If you are looking for a 5 star luxury lodge remotely located along the banks of world renowned fishing rivers, we have just the lodges you are looking for. Alaska Sportsman’s Lodges offer the best fishing packages, service, luxury accommodations, and most importantly, the best fishing opportunities of any other Alaska salmon fishing lodge in the region. Alaska Sportsman’s Lodges has two amazing getaway locations located in the famous Bristol Bay watershed region. 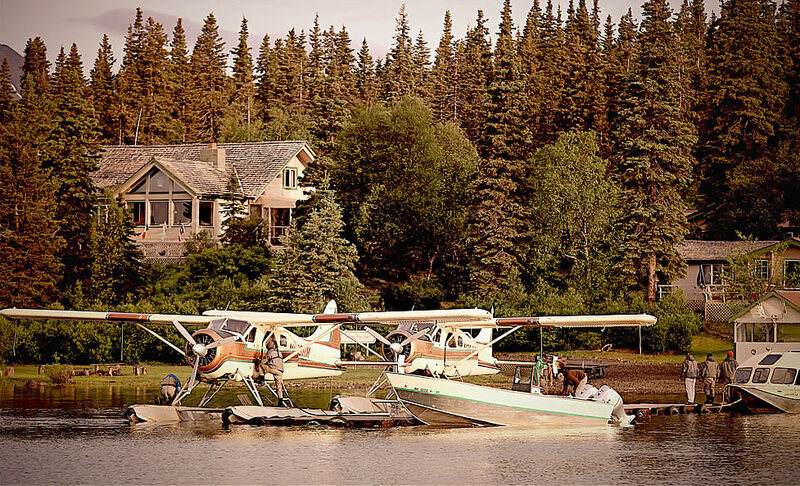 Our Alaska Sportsman’s Lodge is located on the banks of the mighty Kvichak River. Our other Alaska salmon fishing lodge, Alaska Sportsman’s Bear Trail Lodge, rests upon the banks of the Naknek River. These two rivers are world-famous and are host to all 5 secies of salmon and other trophy fish. The full-service fishing packages at each Alaska salmon fishing lodge that we operate provide exactly what every type of fisherman is looking for: big adventure and big fish. No matter which Alaska salmon fishing lodge you choose, we guarantee to give you the best fishing vacation you can imagine. As the months of the sport-fishing seasons unfolds, the availability and quantity of certain fish will wax and wane. For example, if you are looking to catch Rainbow Trout, Arctic Grayling, Char, and Northern Park, then the time for you to come visit our luxury lodges is in the first part of June. If it is a combination of award-winning Rainbow Trout and infamous Alaskan King Salmon, then you should plan your trip around June 15th. In fact, one out of the three best locations for King Salmon fishing is along the Naknek River, right where it flows past the front of our Bear Trail Lodge. The prime time for King Salmon Fishing is from June 15th to July 21st, so if it is the Kings that you want, book your stay at our 5 star luxury lodge during this period of time. If you cannot make it during the King Salmon prime-period, don’t worry!! There are plenty of fine award winning fish in our waters. Our expert fishing guides come from around the world to work for our lodges. They are experts at knowing the best times and the best locations to find the best fish. Following right on the tails of the King Salmon are the Sockeye Salmon. They swim furiously to their spawning grounds by the way of the Naknek and Kvichak rivers. In all reality, any time that you choose to stay with us and take advantage of our world-class fishing services is the perfect time. So, pack your bags and head into the Alaska wilderness; our remote and luxurious lodges await your arrival!